In addition to the many types of material processing which laser technology has already conquered, the discipline of plastic welding is still in its early stages. "Basically this new technology must establish itself on the market first", states Andreas Büchel, Product Manager at Jenoptik automation technology, "and to do so must get over its fear of laser technology." LASYS 2014 can help a great deal in this regard, because the international trade fair specialises in laser material processing, which is unrivalled worldwide. The trade fair takes place from 24 to 26 June for the fourth time at the Stuttgart trade fair grounds and presents the entire range of applications of laser in material processing, special application fields and new fields of applications, as well as the latest innovations. The focus of LASYS is clearly on machines, processes and services. A special feature is its orientation towards all industries and all types of materials. The approximately 200 expected exhibitors also includes companies which can demonstrate their many years of experience in the laser welding of plastics. At LASYS 2014 the visitors thus have the opportunity to obtain advice from competent experts, examine systems and solutions and in this way help reduce their inhibitions. Three exhibitors explain here which requirements must be met and what advantages laser technology offers when joining plastic components. With plastic welding the material and component design are paramount, because not every plastic and not every component design are suitable for efficient processing with laser. Certain requirements must be satisfied and these must be taken into consideration by a manufacturing company in the product planning and design phase. "In general, the material combination must agree", states Michael Nagel, Technical Sales Engineer at Laserline, "this means the plastics must have an overlapping melting range, as otherwise simultaneous heating of both joining members is not possible." "Of the two components during penetration welding the upper component must have sufficient transparency for the wave length of the laser light; in contrast, the lower part should have good surface absorption properties", adds Andreas Büchel from Jenoptik. Attention should also be paid to a laser-compatible design in the construction of the components. For laser penetration welding an even, flat contact is necessary and the area should be clean to enable firm welding. During the joining process the laser penetrates one of the joining members and the energy is absorbed at the joining point of the second component in a layer near the surface. The plastic melts and via heat conduction to the upper component also fuses with the adjoining surface so that the two components are firmly bonded. "As a result, the smallest possible workpiece gap is decisive as a heat barrier", highlights Thilo von Grafenstein, Marketing Manager of Acsys Lasertechnik, and adds: "The actual challenge during laser plastic welding is the precise clamping of the components. Through an intelligent combination of a beam source, beam shape and processing strategy, both transparent-absorbing plastics and other plastic combinations can be welded." A suitable clamping device for the components to be joined is thus essential for welding and has a huge influence on the efficiency. Laserline expert Nagel mentions another laser plastic welding process: "With Multi kW plastic welding the material is heated in the crotch area and immediately pressed on afterwards using a roller. This technique is being used more and more for joining fibre reinforced plastic strips and during laser edging in the furniture industry." But what advantages do the experts see in laser technology compared to conventional joining methods? Von Grafenstein argues: "Lap welding of plastics enables concealed seams with minimum component interaction. When welding with hot air or heating elements the components are heated extensively, which is harmful for sensitive components." Mechanical and thermal loads are very low with the laser light as a tool and the energy input is effected without contact. "In contrast to ultrasonic and vibration welding, no vibrations and dry friction occur and the associated lint formation is prevented as is the expulsion of molten metal", adds Nagel. And Jenoptik expert Büchel adds: "With our systems we obtain a high welding quality with maximum strength close to the inherent strength of the base material – greater than 90 percent. This means ribs and reinforcements can be dispensed with and a lower material thickness can be used, which in turn leads to material savings. The use of materials with a low melt flow index is also possible, which results in costs savings during injection moulding." "In comparison to other joining processes, such as bonding or screw connections, laser welding does not need any additional materials", is another advantage the Acsys Marketing Manager mentions – and the list is not yet complete. LASYS 2014 will reveal more detailed advantages of laser welding. For visitors who are not sure how they can optimally implement their manufacturing tasks, there is once again an advice centre, the Solution Center "Meet the experts", at the entrance to Hall 4. Employees from five renowned research institutes share their knowledge and look at the specific problems of visitors. The independent advice is provided free of charge and is non-binding. The consultants also refer to exhibitors who offer solutions for individual problems. LASYS exhibitors are showcasing many interesting applications especially for industry. For example, Jenoptik has various welding technologies based on diode lasers, which will be presented at LASYS. These include: contour welding, quasi-simultaneous welding, simultaneous welding with a unique radial welding technology, as well as welding with a switchable laserline. 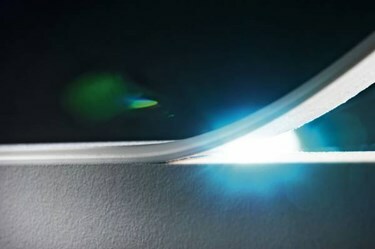 "The switchable diode laserline with a length of roughly 100 millimetres is the big innovation, and at the same time a unique selling point of Jenoptik", states Andreas Büchel. The various technologies can be integrated in different expansion stages in the machines Jenoptik-Votan W for large components and Jenoptik-Votan W Compact for small components. With Laserline the diode laser can be produced in many different configurations based on a modular concept. Typically, the optics, as an actual tool, is adapted to the specific requirements of the application. In addition to round focus geometry, the company also offers linear and rectangular focus with the option of a dynamic change during machining. "The homogeneity in the laser focus", reports Nagel, "is decisive for a high-quality and even weld connection." The diode laser from Laserline has been used since 2009 in furniture production for sealing narrow areas. Together with the equipment manufacturer IMA Klessmann, a zoom function was developed in several steps. "The aim was", continues the laser expert "to machine different edge heights in production with lot size one". The edge is guided along the side of the machining tool and beamed with the laser shortly before reaching the furniture part. The absorption layer in the edge melts and immediately thereafter the edge is pressed onto the workpiece, where it establishes a positive and permanent connection with the furniture part. "The result is a high-quality optical zero joint with excellent water vapour resistance, for example for use in kitchen or bathroom furniture", states Michael Nagel. Acsys has developed a modified Barracuda system specially for laser welding in the automotive sector. For example, speedometers are welded and through a connection between the company's internal database and the laser system consecutive numbering is also introduced. Von Grafenstein states: "This is another advantage of laser, that it can label the component in the same work process - something similar to a DataMatrix code." The importance of laser technology as a tool in plastics processing is growing and as a result laser welding processes will be used more and more. "Whereas ten years ago the principle of penetration welding at approx. 200 W plus scanning system was the standard application for the laser processing of plastics", observed Laserline expert Michael Nagel, "today more and more plastics are being fused directly with the laser just before the joining stage in the consolidation area. Fibre reinforced plastics in particular are being joined into diverse 3D geometry and used in aviation or in the automotive industry, as well as for pressure vessels." Andreas Büchel from Jenoptik sees a trend towards lightweight components with higher or multifunctional requirements, for example in the automotive and supplier industry: "With laser processing the increasing requirements of design and safety can be reliably met." The laser technology must be fit for the flexible use demanded by innovative machine concepts. Büchel sums up: "The necessary devices for joining the components must also become more straightforward and cost-effective, and the complete implementation phase from the idea to the solution must be shortened significantly." A platform just like what LASYS 2014 offers is just the place for visitors looking for even more background information, in addition to a comprehensive exhibition section with innovative machine concepts and practical solutions. A comprehensive framework programme provides current information about the latest market events and trends, as well as excellent training opportunities for visitors: the Short Course "Basics on Laser and Laser Material Processing" for those with little or no experience in laser material processing, the Stuttgart Laser Technology Forum SLT ‘14, the "Lasers in Action" forum, the Stuttgart Laser Marketplace and for the first time the presentation of the two topics "Laser additive manufacturing" and "Robotics & Automation". Exhibitors showcasing exhibits on these two trend topics are marked with a corresponding pictogram. Interested visitors are then guided along this thematic trail using the pictograms. The automotive shows Engine Expo, Vehicle Dynamics Convention, Global Automotive Components and Suppliers Expo, Automotive Testing Expo, as well as the Automotive Interiors Expo, are also taking place parallel to LASYS on the Stuttgart trade fair grounds located directly beside the airport. In addition, O&S, the international trade fair for surface treatments and coatings, as well as parts2clean, the leading international trade fair for industrial parts and surface cleaning, will open its doors at the same time.